How we look at something determines (and is determined by) our experience of the world. For most of us it's aseamless process going on in the networks of our brains, but shine a spotlight on that procedure and you canreach a kind of post-modern enlightenment--the kind that raises more questions than it answers. Tokyo-based artist Yosuke Ito has always coupled low technology and high ideas to highlight for art-goers theprocesses by which we humans take in raw data and construct sense-making narratives. Yosuke considers himselfan aesthetic architect, and his current gallery construction, "Lighting Loop," at M55 Art, is a room-sizedsculpture using light, electricity and air as raw material; it breakes new ground for the artist in that it is partlyinspired by an overt political idea--the problems of the environmental crisis. Colorful toy propellers stand propped in one corner of the gallery, powered in their spins by tiny solar cells. 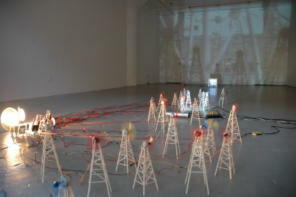 Thedigital image of these spinning propellers is sent to a light projector, which throws both the digital images as wellas the shadows of the actual propellers onto the opposite gallery wall. The result is a kaleidoscopic array of giantwind machines, the colored images intermingling with their shadowy doppelgangers. A visitor examining “Lighting Loop” soon realizes that you understand the piece thanks to two distinct modes ofperception: the analytical scrutiny of the mini-infrastructure--the wires, little wind machines and playing-card-sized solar panels--and the visual absorption of the image projected onto the wall. You catch yourself in a left-brain/right-brain split; we analyze structures but absorb images. The implications are enormous, and not just forenvironmental issues: Do we analyze our political ideas, or simply absorb them?